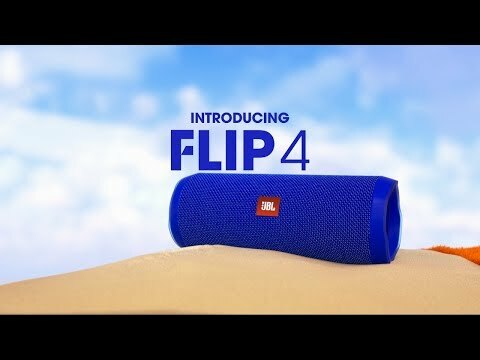 JBL Flip 4 is rated 4.4 out of 5 by 860. Rated 5 out of 5 by Stickrat_2002 from Great product Enjoy this product and use it every day. I have 2 flip 4’s and a charge 4 . Rated 5 out of 5 by Chris55 from Works well and has some good bass. Overall good its very nice to use and I use it every day. Is there a way to shut off or turn down the volume of the start up noise? I like to use this speaker in a office environment but I don't like how loud the start up noise is? Is there a fix for this? I agree - it is loud on startup, so we just muffle it (pillow, seat cushion, jacket etc) before turning it on. This is the Only minor complaint, otherwise we LOVE the darlin! Can I lower the volume of 'connecting sound' and 'power on/off' ? I think they are way too loud. Please fix this with a firmware update so that we can use the JBL Connect app to change it. It is super annoying to have such a loud startup and shutdown sound. Why would JBL make such a thing with no option to disable it or at least lower it? Not everybody is using the Flip speaker at a frat party. Think about people who might be using it in an office situation, or for ambient music in a quiet environment. Just got the JBL Flip 4 and it doesn't have a case or charger, so I bought a case but what charger is factory recommended with this. JBL released an update. Go into the JBL Connect app with your Flip 3 and update the firmware and now you should be able to connect it to your Flip 4. But, now that Flip 3 can only connect to other speakers featuring JBL Connect+. I'm using Flip 4 to playing guitar, using the 3.5mm line in. If I don't play a note for 5 seconds, it goes into a power save mode, at which point the next note I play is not audible while it &quot;wakes up.&quot; Possible to extend this time/disable? Hi all, I have the same problem. I have used OP-1 as well but any audio source prodces the same proble. Approx 5 seconds after audio drops below a certain level (TBD) the turns off the speaker drivers and requires another singal more than threshold (xxmV TBD) for approx seconds or so to enable the output. This means you cannot use this speaker to play any music, live or recorded, that has quiet portions. The &quot;no signal&quot; timeout setting should be made much much larger than 5 seconds and possibly reduce the level (as we all do not play hyper compressed music through these speakers). Approx 1minute timeout would be more sensible. One assumes this is a software issue. Can you update the firmware to change this timeout? The FLIP 4 is rated at 2 x 8W while the Charge 3 is rated at 2 x 10W with bigger passive radiators on both sides making the latter more powerful when it comes to audio and deep bass. The Charge 3 also has a built-in rechargeable Li-ion battery that supports up to 20 hours of playtime and charges smart phones and tablets via USB. Will the flip 4 fit inside the flip 3 case? No, the Flip 3 carrying case is too small.&nbsp;At the moment, no carrying case is available for Flip 4.&nbsp;We suggest that you check out manufacturers that specialize in this kind of accessory. What do I do if my speaker is making a static and fuzzy noise, only having it for about 4 months? And have kept it in perfect conditions, as in not putting it in water, not blasting music, and not keeping it in hot conditions. Our sincerest apology for the inconvenience. I can see that&nbsp;you've already submitted a case with us and is already being handled by one of our Customer Service Representatives. Please reply to their communication if&nbsp;you&nbsp;need anything additional. Thank you.